Like a classical Drama, Greek debt is characterized by unity of place (Greece within the EU), unity of time (2010-2015), unity of action (the policies enforced by the 2010 and 2012 memoranda that resulted in a 25% fall in the GDP and an unprecedented peace-time deterioration of the Greek people’s living conditions), and clearly identified characters (the Troika institutions, the Greek governments, some private creditors). Debt restructuring is often used to launder illegal and/or odious debts so as to give them a look of legality and legitimacy. In such cases audits usually have to go 10, 15, or even 30 years back in time. In Greece the situation is different. Zoi Konstantopoulou (center) and Eric Toussaint (right) at a press conference on the Greek debt audit. The recent debt currently being claimed presents features that make it irregular, illegitimate, illegal, unsustainable, and even odious. Allegedly Greek debts that were accumulated before 2010 were already to a large extent illegitimate and/or illegal (arms contracts involving fraud and corruption, large-scale construction-work related to the 2004 Olympics with overbilling and all sorts of embezzlement, tax giveaways to a privileged minority, bailing out of banks, excessive interest rates), but what is striking is the extent to which debts contracted since 2010 are flawed. enforcing recessives and regressive neoliberal macroeconomic policies (privatisations, layoffs, drastic reduction of income, etc.) thus violating economic, social, and cultural rights as well as civil and political rights. The process amounted to a brutal internal devaluation. In 2015 alone, creditors have claimed €23 bn from Greece. While several deadlines have been met since agreements were signed in February 2015, Greece is now close to financial unsustainability. Many analysts consider this to be the case already, and some add that repaying its public debt is unsustainable with regard to human rights given the extent of the humanitarian crisis and the urgent need to muster financial means to find solutions. Several ‘heterodox’ journalists in the mainstream financial press (Wolfgang Munchau in the Financial Times, Romaric Godin in La Tribune…) argue for a suspension of payment and for a cancellation of the Greek debt. Considering how urgent the situation is, as well as the expectations of citizens who voted for change, the Committee for the Truth on the Greek Debt is focusing on an analysis of the 2010-2015 period. Obviously previous debts will also be audited and some members of the Committee are already working on this. Illegitimate public debt: debt that was contracted by a government without considering the public interest, a debt contracted in favor of a privileged minority. Illegal debt: debt contracted in violation of the current legal or constitutional system. Odious public debt: granted on conditions that violate fundamental human rights (social, economic, cultural, civic, and political rights of the people). Unsustainable public debt: debt that can only be paid back with dire consequences for the people, such as a dramatic degradation of their living conditions, of access to health care or education and an increase in unemployment. In short, a debt that undermines basic human rights. An unsustainable debt is a debt whose repayment makes it impossible for governments to guarantee the population’s fundamental human rights (good public health system, good public educational system, good social protection system, decent wages, and retirement pensions, etc.). During its second plenary session from 4 to 7 May 2015, the Committee for the Truth on the Greek Public Debt adopted definitions for illegitimate, illegal, odious, and unsustainable debts. After studying several aspects of the debt currently claimed from Greece, I am convinced that we can find evidence of it being irregular, illegal, fraudulent, and unsustainable, which leads us to the conclusion that most of it is legally void. With regard to the illegitimate or indeed odious nature of the debt, several authors consider that three conditions must be present, namely lack of consent, lack of benefit to the population, and awareness of the lenders. I put forward that those three conditions are present in the case of the Greek debt. Neither the population nor its representatives gave their bona fide consent, and democratic rules were not adhered to; the population most obviously has not benefited from the policies implemented; and creditors, particularly the Troika institutions, were aware of the fact that the measures they enforced would not improve the population’s living conditions since they demanded and still demand that tens of thousands workers be laid off, that wages and pensions be lowered, social expenditure decreased, freedom of negotiation restricted, etc. Why is this third aspect essential? Most public debts of industrialized countries are in the form of bonds or securities that States sold on the financial markets. The buyers (in most cases banks) generally claim not to know exactly how the money received by governments is used. Now in the case of Greece, this argument does not hold water since the money is loaned with contracts that stipulate a number of conditions that are made explicit in agreements and attached documents such as memoranda and implementation reports. make creditors responsible for what they do to reduce moral hazard and prevent them from granting loans that violate fundamental human rights. We ought to stress the historic nature of the current auditing process in Greece. There have been many sovereign debt crises over the past two centuries. In the 1930s, most European countries went through extensive periods of default. At the time of the London agreement on the German debt in 1953, Germany had been defaulting since 1932 (for over 20 years). Since the Second World War there have been 170 cases of defaulting and over 600 cases of debt restructuring. But the Greek situation is unique: for the first time in Europe, a country’s government has set up an independent auditing process with citizens’ participation. 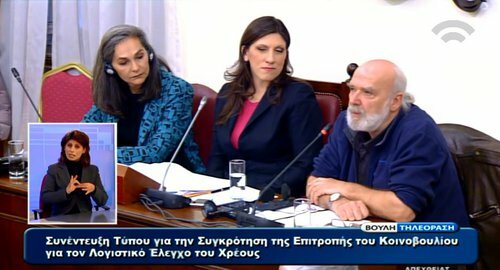 This makes the President of the Greek parliament Zoe Konstantopoulou’s initiative an exemplary democratic gesture. Eric Toussaint is founder and spokesperson of the Committee for the Abolition of Third World Debt and the head of the Committee for the Truth on the Greek Debt. This article was translated from the French by Christine Pagnoulle and Vicki Briault Manus and previously published in English on International Viewpoint.